Oh look, lipstick is back! These princesses puckered up for the cameras and set the tone for an evening out, in cadmium, coral, scarlet and fuchsia. Naomie Harris laughs it up at the preem of Mandela: Long Walk to Freedom. I’m totally copying this look. Maria Bello contrasted her phthalo blue ensemble with the perfect brick-red and terra-cotta blush. 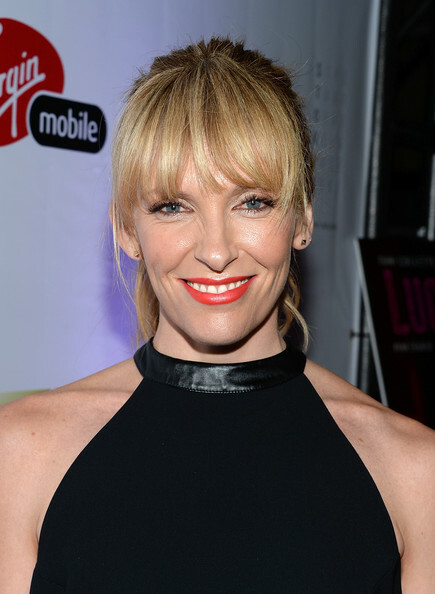 Toni Collette kept it simple with a Robert Rodriguez dress, accented with a deep coral lip. Melissa George made both mat and matte look stunning in scarlet. Does anyone know who made her dress? Calvin Klein? Lanvin? Margiela? This colour seems to be on everyone’s lips – Vanessa Paradis in Alexandre Vauthier. Liv had the same idea in terms of necklines when she attended the Rush premiere in London earlier this month. I think it’s one of her best beauty looks yet, so I had to share it here. …also found in multiple TIFF locales. The only pale lip that caught my eye was on Ms. Marion, who, let’s face it, can do no wrong when it comes to giving good face. That’s the word on the best beauty at TIFF, from my Rouge Noir lips. And in case you are wondering, no, I do not miss invisible lips. They make me pout.